U.S. News & World Report recently declared three Honda models as the Best Cars for the Money  in their respective categories. In the Compact SUV category, the 2017 Honda CR-V was the top choice. Taking the award in the Subcompact SUV Category is the 2017 Honda HR-V, while the 2017 Honda Fit took the Best Car for the Money award in the Subcompact Car category . The award criteria include long-term value, safety, reliability, performance, and cost of ownership of each vehicle. These three Honda vehicles have proven to excel in each of these categories, and for good reason. The Honda CR-V was recently given a thorough redesign. The 2017 Honda CR-V from Weir Canyon Honda has a distinctive new face featuring available full LED headlights and attractive sculpted styling. The CR-V is offered with an available 1.5-liter turbocharged engine that produces 190 horsepower. The new Honda CR-V can be equipped with 2WD or AWD to suit your needs. You can also rely on Honda Sensing™ in your CR-V, a suite of safety technology to aid the driver and help avoid or mitigate emergency situations. Our new Honda HR-V for sale near Irvine, CA is the little brother of the CR-V. This compact SUV comes full of style and convenience. The exterior of the HR-V is sporty, while inside you’ll find spacious seating for five. Honda’s Magic Seat® functionality gives you all kinds of options for configuring the seats when it comes time to load the HR-V with cargo. It’s also got helpful tech like navigation, touch screen display, and HondaLink® to sync your devices. You can even equip your new Honda HR-V from Weir Canyon Honda with all-wheel drive, making your drive all the more fun. The 2017 Honda Fit in Anaheim, CA is a small hatchback that offers a surprisingly roomy interior. You’ll find up to 52 cubic feet of cargo space inside the Honda Fit. The second-row Magic Seat® offers unique 60/40 folding and four setups, allowing you to fit all your cargo. When the rear seats are not folded, the new Honda Fit comfortably seats five passengers. For a little touch of luxury, the seats, shift knob, and steering wheel of the Fit can be trimmed in leather. A six-speed manual transmission is even available for the enthusiast driver. If you’re ready to get a great value vehicle for your money, choose a new Honda vehicle for sale in Anaheim, CA at Weir Canyon Honda. Our Orange County, CA Honda dealership offers the latest Honda models, including the 2017 Honda CR-V, Honda HR-V, and Honda Fit. 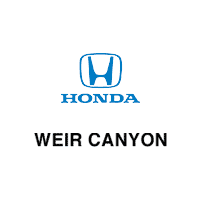 Save on a new Honda near Fullerton, CA with our new car specials when you visit Weir Canyon Honda today!